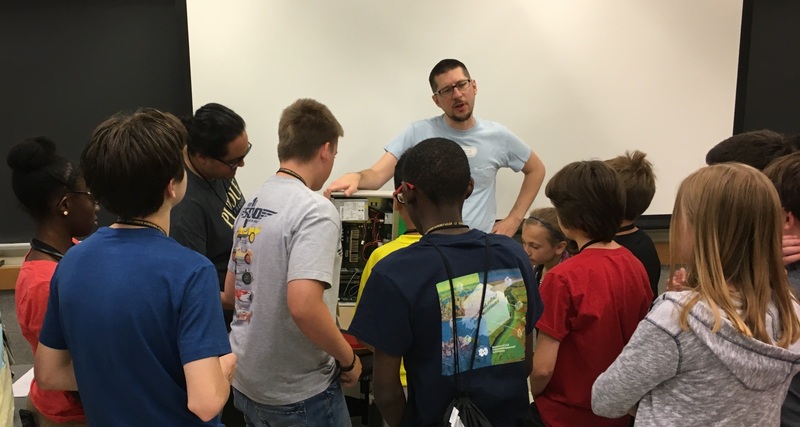 The K-12 Outreach program in the Department of Computer Science at Purdue University is committed to improving computer science education for Indiana students. Access to high quality computer science instruction is increasing throughout the state, with a commitment to providing CS as part of the K-8 science curriculum. Purdue's K-12 Outreach program aims to assist this growth by addressing the needs of K-12 teachers and students. Our aim is to support any group that is interested in working with K-12 students to improve their access to computer science education. We work primarily in the area surround Purdue's West Lafayette campus, but frequently visit locations as far as Chicago and Indianapolis. For schools and communities, we partner to help provide instructional aid by sending students from our service-learning groups to run CS activities or give talks about studying computer science at the university level. We also work with state and school corporation leaders to help devise plans for schools to offer computer science, and to train teachers to be able to provide their students with high quality computer science instruction. If you can't find the information you're looking for, or would like additional information on any of our programs, please contact us.